The beginner's guide to starting hives in your backyard or garden. 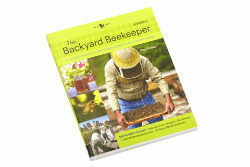 Recently revised and expanded, the book presents you not only with the tips and tools of the hobby, but also the information to best prepare your yard or garden for your newest buzzing bees. From how to harvest honey to recipes to use it in, The Backyard Beekeeper will walk you through from setup to safety to savoring!